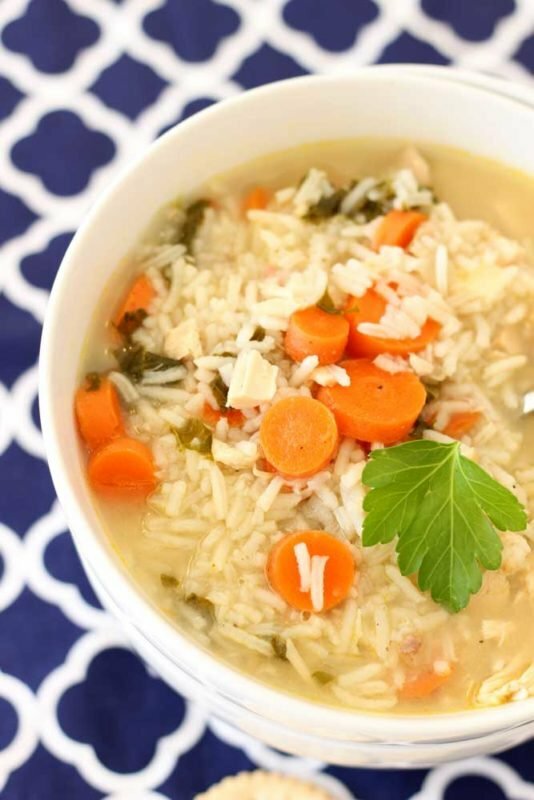 This Leftover Turkey and Rice Soup is a perfect way to use up all that leftover turkey from the holidays! This soup is full of flavor and easy to throw together! Grab your leftover turkey, chicken broth, carrots, celery, and some other basic ingredients you have lying around your kitchen and you are all set! This soup is a perfect post-holiday meal for everyone and is guaranteed to keep you warm! Who had turkey for their Thanksgiving or Christmas dinner this year? How much leftover food do you have from your holiday meal? If you are anything like me, I have a lot of food left over….especially a lot of leftover turkey. My parents and nephew even came over to get several plates of food to take back to their house and I still have a ton of food left over! I was talking to my friend yesterday about what she’s doing with her leftover turkey and she said she made a wonderful turkey and rice soup. She was telling me about all the ingredients she put in her soup and it totally inspired me to come up with my own version of Leftover Turkey and Rice Soup! So I literally came home and went through my refrigerator to see what ingredients I had so I could make this soup. I found fresh garlic, onion, kale, celery, carrots, rice, chicken broth, white wine and of course…leftover turkey! This is the easiest soup I’ve ever made! I pulled out my big pot and started sautéing my chopped onions, garlic, carrots and celery in olive oil. Next, I added in some leftover white wine I had from the holidays. I then added in chicken broth and let that simmer until my vegetables became soft. Next steps are super easy…I added in the rest of the ingredients and let my turkey and rice soup cook for about 20 minutes and it was done! It was that easy! Super simple! And it’s a good thing too because I’m the cold and flu bug has hit Mason Manor! My little guy and I don’t feel fantastic but you know what…this soup has been just perfect for us to eat! He’s also enjoying my Potato Cheese Soup with my Quick Peppery Cheese Bread and my Tomato and White Bean Soup with Grilled Cheese Dippers. 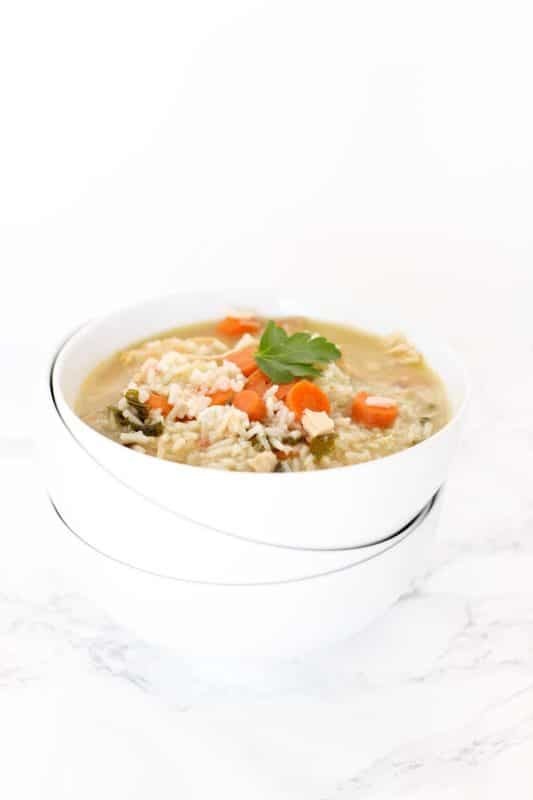 Gosh – I just love a good soup when I don’t feel great and this Leftover Turkey and Rice Soup has been perfect for our much needed low key lunches and dinners. And…it’s gluten free!! AND my little guy loved this soup and it’s all he wants to eat! Happy leftover eating my friends! Don’t let that leftover turkey go to waste and stay well! have a happy, safe and healthy New Year!! 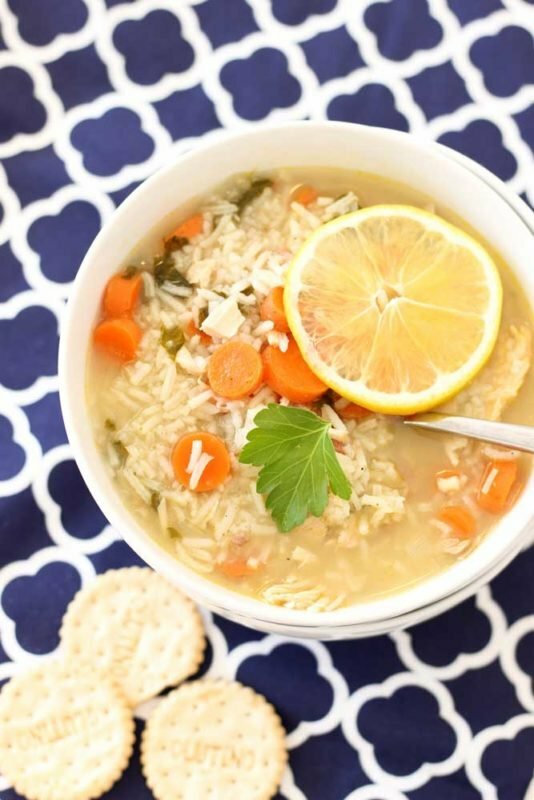 This Leftover Turkey and Rice Soup is a perfect way to use up all that leftover turkey from the holidays! This soup is full over flavor and easy to throw together! Grab your leftover turkey, chicken broth, carrots, celery, and some other basic ingredients you have lying around your kitchen and you are all set! This soup is a perfect post-holiday meal for everyone and is guaranteed to keep you warm! Turn your stove range to medium high heat. In a large pot, pour 1 Tablespoon of olive oil and sauté chopped onion, carrots, celery and garlic for about 5 minutes or until the vegetables turn soft. Add in the white wine and chicken broth to the large pot of sautéd vegetables. Stir well. Immediately add in the uncooked Basmati rice, leftover turkey and raw kale. Cook on medium low for about 20 minutes. Add salt and pepper to taste. Squeeze in fresh lemon slices to add a lemon taste. Store all leftovers in the refrigerator. Don't overcook this soup or all the broth will soak into the rice. Save this Leftover Turkey and Rice Soup to your favorite Soup or Holiday Leftover board on Pinterest! Yes- you can taste the difference! Such a great soup! I love how easy and versatile soups are – This sounds like a great one! Looks delicious, Amanda! Love the basmati rice and lemon! Thanks! 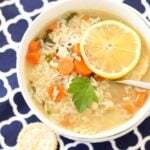 The added white wine in this dish along with the lemon and basmati rice makes this soup!! This soup looks so delicious! Perfect for cold winter days on the farm! I had this for dinner again tonight and my kids and hubby raved over it! Perfect for this cold weather right now! oh this Leftover Turkey looks so delicious… wish I had some right now! I’ve been eating on this all week!! I love turkey soup! 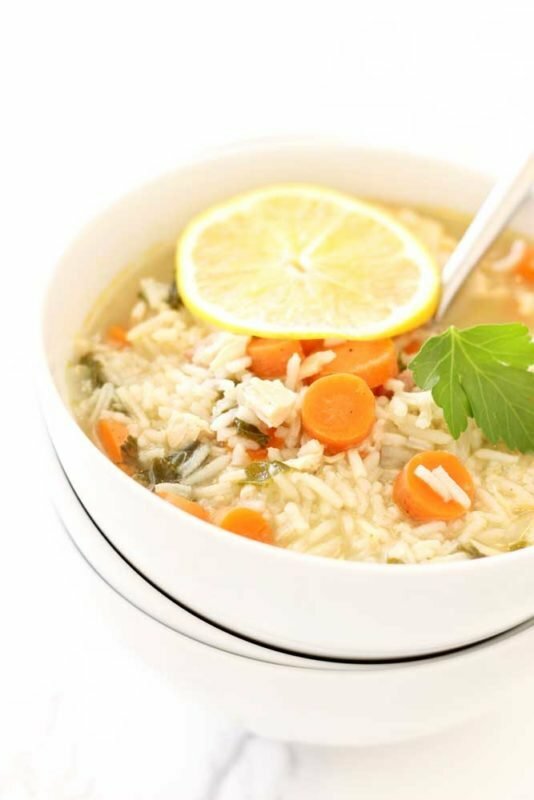 Your turkey and rice soup looks so delicious! I rarely have leftover turkey because my sister cooks it at her house and I never take leftovers since I’m usually stuffed! But, I’m glad the stores sell cooked turkey breasts as I will be getting some to make your delicious soup! Yes, and most of the time the turkey at the grocery store is smoked which is AMAZING! Smoked turkey is amazing in this recipe!